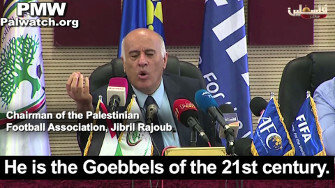 "the Goebbels of the 21st century"
Jibril Rajoub, one of the top Palestinian Authority leaders, attacked Palestinian Media Watch yesterday, calling PMW's director "the Goebbels of the 21st century." 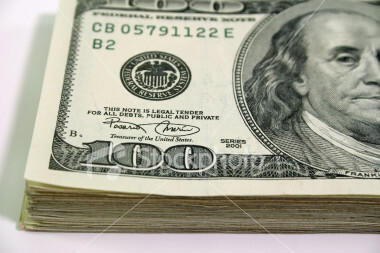 "They are waging this war on all fronts. 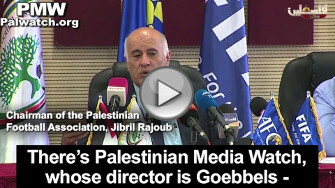 There's Palestinian Media Watch, whose director is Goebbels - Goebbels, Hitler's ideological theorist... He is the Goebbels of the 21st century. He prepared an indictment against me... I traveled to Latin America, and every place I go, believe me, he spreads these accusations. 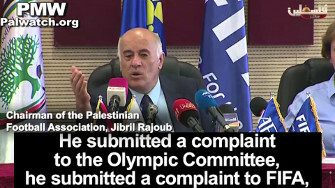 He submitted a complaint to the Olympic Committee, he submitted a complaint to FIFA, and when I traveled to the US - he also spread [his accusations] in the US. The only thing he does is to deal with me." In fact, PMW has been using every legal means available to challenge Rajoub ever since he incited to murder Israelis during the 2015-2016 Palestinian terror wave in which 44 Israelis and others were murdered. Rajoub publicly glorified the murderers, calling them "heroes and a crown on the head of every Palestinian" and said that the Fatah Movement "blesses and encourages" the terrorists. Rajoub also openly called for the targeting of "settlers and soldiers." Today, Palestinian Media Watch, together with families of terror victims, added pressure on Rajoub by submitting a petition to the Israeli Supreme Court asking the Court to order the government to respond to PMW's police complaint and investigate him for incitement to murder.